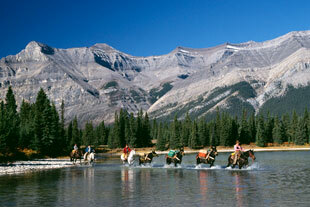 For years visitors from all over the world have explored the Canadian Rockies back country on horseback. They have come in search of remote valleys and alpine lakes, and looked forward to settling into authentic western camps at the end of the day. For most people, one day in the mountains is just not enough. Multi-day pack trips are the answer for those who want to get into the real back-country, relax and recharge their batteries in the splendour of nature, learn more about riding, and enjoy the companionship of horses to an extent not possible on shorter treks. The outfitters that Home On The Range Adventure Tours has selected to work with to provide wilderness horse trips encourage active participation of their guests, including the care of the horses and general camp duties, creating an authentic atmosphere that is rewarding and fulfilling. 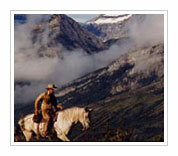 They strive to present an authentic Canadian Rockies horseback adventure. 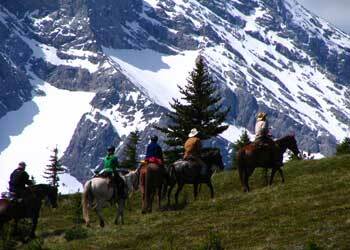 These outfitters offer western horseback adventures and trail rides from 2 days to 2 weeks in the Canadian Rockies. Join them as they explore rugged and remote trails where people are rarely seen, and experience all the majesty of nature as the first explorers of this magnificent wilderness did before you. These are not large corporate ranch operations that we work with. Each outfitter prides themselves on leaving as small a footprint as possible on the wilderness areas they explore. There will definitely be less luxury on your Rocky Mountain pack trip than you will find at your local spa. However, in exchange we offer a genuine, real-life adventure, breathtaking scenery, camaraderie of the trail, excellent camp-fire cooked food and the opportunity to learn as much as you can about horses, riding and living with nature. Come experience the Canadian Rocky Mountains as only a cowboy can see them. Trip prices may vary depending on time of year, accommodations, amenities, and location. Each trip includes all equipment & supplies, accommodation, guide, meals and horse. Pack Trips ranging from 2 Days to 2 Weeks are available on request. For folks who are looking to take a little bit of home into the back-country, Sundance and Halfway Lodges provide just the right combination. Evenings are spent in a cozy lodge. We call that roughing it the civilized way! Surrounded by the beauty of towering peaks, Halfway Lodge has been a welcome haven for over 75 years. Rich in tradition, this cabin was used back in the late 1920's as a stopover for guests traveling from Banff to Mount Assiniboine. Halfway has remained pretty much as originally built, with the exception of a second story added in 1967 when a bear made an appearance through an unexpected entrance - the roof! Thanks to the bear, Halfway now sleeps a maximum of fourteen guests. The lifestyle at this rustic backcountry cabin remains much the same as it was 75 years ago - simple. Propane lanterns and candles provide the lighting, and a woodstove keeps the water hot and the cabin warm and cozy. Note: At Sundance Lodge, private sleeping arrangements are possible depending upon trip size, but are not guaranteed. Sundance has 10 sleeping rooms with 3 beds in each room, rooms are designated on a choose your own basis once at the lodges. Halfway is equipped with single beds only and sleeps 14 guests in 4 rooms. Tours depart early May to mid October. Departs Sundays & Thursdays, June 24 to September 13, 2019. Riders meet at our office at 9:30 a.m. and are transported by van to Warner Stables. There they are met by their guides and horses and mount up for the ten mile ride to Banff Sundance Lodge via the glacier-fed waters of the Bow River, Healy and Brewster Creeks. For those with a vehicle, free parking is available at Martin stables for the duration of the trip. Once you check-in, directions will be available from our office. The adventure continues southward with a ride up to Halfway Lodge. The trail winds along the historic Strom pack trail with the rugged Sundance Range dominating the eastern horizon. After a good night's rest at Halfway Lodge and a hearty breakfast, it's down to the corral to mount up for the day's ride. Today's trip takes riders to the breathtaking views enjoyed at the top of Allenby Pass. For many this is the highlight of the trip as you climb to an elevation of 8,100 ft.
Today is a rest day, with time for an optional hike or fishing, or a short ride to a glacier fed lake. After a warm good-bye to the cook and Halfway Lodge, the winding trail leads back along the Brewster creek to Sundance Lodge where you will spend the night. The gang gets together for one last day on the trail, a "soft" ten-mile ride from Sundance to Warner Stables, arriving at approximately 4:30 p.m. The adventure has come to a close, but the magic of your holiday will linger on to be relived and shared. ALL DATES & PRICES ARE NEW! The 5 day trip departs on a Monday and spends the first night at Sundance Lodge, the second and third nights at Halfway Lodge and returns to Sundance for the final evening. Saddle up and Ride with North America's #1 Mule Clinician, Brad Cameron. 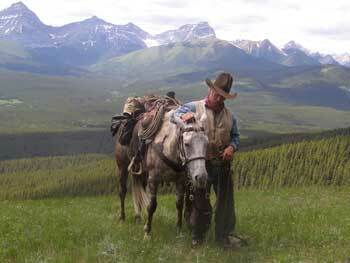 Bring your own mule and join Brad for 5 spectacular days of hands on trail training in the Canadian Rockies. For those unable to bring their own mule, a limited amount of mules are available for rent. Under Brad's careful guidance, Participants will learn how to negotiate many different natural obstacles with safety and confidence. Enjoy the camaraderie and fellowship of other mule riders while endless mule stories are told around the campfire at night. Backcountry meals, comfortable tent camps, and unequalled scenery and all included. This is a unique, one of a kind clinic experience that only Brad Cameron can offer. For the past 5 years we have featured a photography trip to share our remote wilderness with those eager to visit these special places. Professional instruction can help you take the next step towards that perfect image. The adundance of spectacular scenery, wildlife and cowboy lifestyle provide any enthusiastic artist with incredible landscape, portrait and action photos. Raymond will once again be our photo instructor for 2014. He is a long-time contributor to National Geographic Magazine, Books and Traveler's Magazine. He will share come of his secrets and hints for getting the most out of your artist eye and camera's creative potential. This trip takes you deep into the Brewster Creek Valley and up Allenby Pass. Each night you stay in a cozy backcountry lodge. View the itinerary for the 5 day Backcountry Lodge Ride here. Check out Raymond's photos at www.raymondgehman.com. The 4 day ride departs on Sunday and spends the first night at Sundance, the second night at Halfway and returns to Sundance for the final evening. Departs Wednesdays, June 26 to September 11, 2019. Amidst dense fragrant pines and snow-crested mountains that pierce the sky, you’ll get to experience the wild side of Banff that not many visitors get to see. Remote and without any internet or cell service, the back country lodges where you will be staying offer a chance to find peaceful quiet and reconnect with friends and loved ones over a crackling campfire. With a back country expert to guide you, this horseback experience is a chance to learn about the history of early exploration in the region. With four days to wander and discover Canada’s oldest national park, you’ll have plenty of time to relax into the slow pace and peaceful quiet of life on the trail. Departs Wednesdays, June 27 to September 12, 2018. Departs Mondays, May 20 to October 7, 2019. Riders meet at our office at 9:30 a.m. and are transported by van to Warner Stables. There they are met by their guides and horses and mount up for the ten mile ride to Banff Sundance Lodge via the glacier-fed waters of the Bow River, Healy and Brewster Creeks. For those with a vehicle, free parking is available at Warner stables for the duration of the trip. Once you check-in, directions will be available from our office. The adventure continues the next day with a day ride up the Brewster Creek Trail. The group spends lunch on the banks of the Brewster Creek; the ride home may take guests through the weaving river trail or the historic Strom pack trail with the rugged Sundance Range dominating the eastern horizon. Guests say good-bye to Sundance Lodge and mount up for a leisurely ten-mile ride from Sundance to Warner Stables with a lunch stop on the banks of Healy Creek, arriving at approximately 4:30 p.m.
Unscheduled departures may be booked for any day. July/August departures are $909/person. Departs Saturdays, May 18 to October 6, 2019. After a relaxing evening at Sundance Lodge riders mount back up for a second full day in the saddle and return to Warner Stables at approx. 4:30pm. A quick getaway to the backcountry for those without a lot of time on their hands! Unscheduled departures may be booked for any day. Regular rates apply. Tours depart late June to late September. These trips explore some of Banff National Park's most spectacular backcountry. Each of the 3 camps offer their own particular charms. Stoney Creek Camp sits at the junction of Stoney Creek and the Cascade River, and offers the rugged, sculptured peaks of the Palliser Range as a backdrop. Flints Park Camp is nestled into the base of massive Flints Peak. Open vistas and starry nights highlight this beautiful camp. The last camp is aptly called Mystic, with its stands of big, old pine and spruce trees covered with hanging moss, and open, grassy slides; this camp is set in a truly mystical location. All the camps are of a similar set up. Simple luxuries abound: wash stands and hot water, a fire pit for evening socializing, tales and song, a large kitchen tent where meals are cooked and served, plenty of "A" frame canvas tents which make for cozy accommodations, and rustic rail corrals for the horses. Rivers flow nearby for the fishermen or brave swimmers. Each camp is also set up with an electric wildlife fence around the campsite, so there is no worrying about curious critters in the middle of the night! In the evening, the kitchen tent warms up nicely with a hot wood-burning stove and offers plenty of seating/table room for socializing or card games. The 4 day trip departs Mondays and stays one night in Stoney Creek, Flints Park and Mystic camps. The 5 day trip departs Saturdays and stays one night in Stoney Creek camp, two nights in Flints Park camp and one night in Mystic camp. The 6 day trip departs on Wednesdays, stays two nights in Stoney Creek, two nights in Flints Park and one night in Mystic. The riders meet at our office at 8:30 a.m. and are transported by van to the trailhead corral at Mount Norquay. There they are met by their guides and horses, and mount up for the eleven mile ride over Elk Lake Summit between Brewster Mountain and Cascade Mountain, and down into Stoney Creek Camp. A ride is taken toward the headwaters of Stoney Creek, returning to camp for the night. This area is a favorite haunt of Rocky Mountain Bighorn Sheep, who are often grazing in the high eadows, providing ample opportunity for pictures. The riders roll up their duffel, mount up, and ride the ten miles to Flint's Park Camp. This camp, located in the center of open, grassy ridges topped with high peaks, has become a favorite of many of our riders. Wildlife is commonly seen and photographed in this area. A day ride is conducted from camp to Block Mountain, or perhaps to Cuthead Viewpoint - just two of the many points of interest accessible from Flint's Park. This area has much to offer the rider, photographer, hiker and fisherman alike. Once again the riders roll up their duffel in preparation for the ride to the Mystic Valley Camp. At this time the guests have the opportunity to observe the historic art of horse packing, using the famous diamond hitch. When everything is securely in place, the riders mount up and ride into Mystic Valley for the final night. It is traditional with our guides to have a real western dinner for the last night. By this time everyone has become friends, and all are ready for a wind-up get-together. Unfortunately, every trip has a last day, but what better way to end the trip than with the scenic nine mile ride from Mystic Valley to the Mount Norquay Corral. The "Full Circle" has been completed and the riders return to Banff at approximately 5:00 p.m.
Departs Mondays & Fridays, June 24 to September 2, 2019. A ride is taken toward the headwaters of Stoney Creek, returning to camp for the night. This area is a favorite haunt of Rocky Mountain Bighorn Sheep, who are often grazing in the high meadows, providing ample opportunity for pictures. The riders roll up their bedroll, mount up, and ride the ten miles to Flint’s Park Camp. This camp, located in the center of open, grassy ridges topped with high peaks, has become a favorite of many of our riders. Wildlife is commonly seen and photographed in this area. A day ride is conducted from camp to Block Mountain, or perhaps to Cuthead Viewpoint – just two of the many points of interest accessible from Flint’s Park. This area has much to offer the rider, photographer, hiker and fisherman alike. Once again, you will take a day ride to one of the many scenic points of interest in the area. In and around Flint’s Park there is never a shortage of interesting activities for the rider, photographer, hiker and fisherman alike. Unfortunately, every trip has a last day. Once again the riders roll up their bedroll in preparation for the scenic ride back to the Mount Norquay Corral. The “Full Circle” has been completed and the riders return to Banff at approximately 5:00 p.m.
Departs Wednesdays, June 26 to September 4, 2019. The 3 Day Stoney Creek Pack Trip is perfect for people who don't have a lot of time, but would still like to enjoy the memorable mountain experience offered by this taste of the back country. On this trip, you’ll venture deep into the secluded Banff backcountry and through the wilderness on horseback – walking in the steps of the First Nations and the founders of Banff National Park. The Stoney Creek Camp is located (10 miles - remove) north of Mt. Norquay. (, situated on the banks of Forty Mile Creek - remove). Once in camp, guests can relax in the kitchen tent, take a short hike, or try their luck at fishing in the creek. The riders meet at our office at 8:30 a.m. and are transported by van to the trail head corral at Mount Norquay. There you meet your guides and horses, and mount up for the ride over Elk Summit to Stoney Creek Camp, with a lunch stop at Elk Lake. After a hearty ranch style breakfast, mount up for a stunning day ride to Dormer Pass. You will spend another full day on the trail with a lunch break at one of the many spectacular vistas, and then return (back - remove) to Stoney Creek camp for the second night of your stay. Roll up your bedroll and mount up once again for the leisurely ride (along 40 Mile Creek - remove) back to the Minniwanka Corral. Approximate arrival time in Banff is 5pm. Experience the wonder of Kananaskis Country - 4200 square kilometres of towering peaks, high mountain lakes and alpine meadows located in the heart of the Alberta Rockies. These back country pack trips are operated in a truly unique area, riding into remote locations in the high country with virtually no other users. Each day riders will enjoy a picnic lunch and have lots of time to take pictures of the spectacular scenery. All of the staff are very personable and have an abundance of experience. In the traditional manner, all gear and food supplies are packed in with the horses. Everything, except sleeping bags and personal gear, is supplied for your trip. 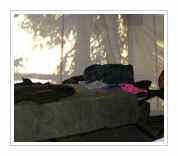 The camps offer comfortable accommodation, in weatherproof tents or painted tepees, with foam mattresses on camp cots. And, for those mountain air appetites, hearty, home-cooked meals are prepared on a wood-burning stoves in the large kitchen tents. Every day is a once in a lifetime experience, with unique destinations including high passes and high alpine lakes. Fishing is good in these parts and the views and photography opportunities are extraordinary. 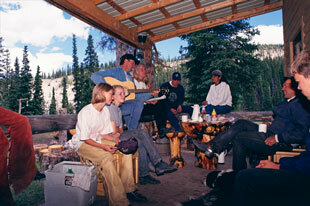 To round out each day, what could be better than a sing-song around a blazing campfire before turning in for the night. Explore a part of the country that you’ve never experienced before and ride, hike or just relax in the mountain sun. Plan to arrive at the ranch promptly at 9:00 a.m.. You will be matched with a compatible horse and given a short orientation, then it’s an undemanding 13 mile ride up the Evan Thomas Valley to the main camp. Along the way enjoy a picnic lunch with plenty of time to take pictures of the spectacular scenery. After settling in at the camp, and taking time to explore the surrounding meadow, listen for the dinner bell. 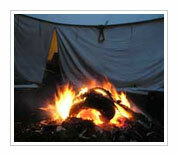 All of the hearty meals are prepared in large kitchen tents on a wood burning stove. At the end of the day, what could be better than gathering around a blazing camp fire before turning in for the night. The comfortable camp provides cozy accommodation in large, canvas wall sleeping tents or painted tepees with foam mattresses on camp cots. Plan to arrive at the ranch promptly at 9:00 a.m.. You will be matched with a compatible horse and given a short orientation, then it’s an undemanding 13 mile ride up the Evan Thomas Valley to the main camp. Along the way enjoy a picnic lunch with plenty of time to take pictures of the spectacular scenery. After settling in at the camp, and taking	time to explore the surrounding meadow, listen for the dinner bell. All of the hearty meals are prepared in large kitchen tents on a wood burning stove. At the end of the day, what could be better than gathering around a blazing camp fire before turning in for the night. The comfortable camp provides cozy accommodation in large, canvas wall sleeping tents or painted tepees with foam mattresses on camp cots. Today begins with a hearty camp breakfast. Then the horses are saddled, and the group heads out to a wonderful 360 degree panoramic view point looking back down the valley you rode up yesterday and forward to two passes. The higher of these passes, which you’ll visit in the next few days, is over 8,000 feet. Later in the day, after lunch by an Alpine lake, you’ll ride down a box canyon, crossing a winding creek several times, before arriving at camp. From Happy Valley it’s on to the TRCR traditional Tepee Town Camp, home for the remaining days of your adventure. Accommodation at this location is in painted Indian Tepees and tents beside the north fork of the Little Elbow River. On the remaining days of the Five and Six day pack trips, you will ride to unique destinations including high passes and high alpine lakes. Fishing is good in these parts and the views and photography opportunities are extraordinary. On the final day, you continue riding south, enjoy lunch by a beautiful alpine lake and then travel onward to your rendezvous point in the Highwood Pass. From here you will be transferred by road back to your starting point at the ranch. On the final day, you continue riding south, enjoy lunch by a beautiful alpine lake and then travel onward to your rendezvous point in the Highwood Pass. From here you will be transferred by road back to your starting point at the ranch. Please e-mail info@homeontherange.ca for confirmation of availability for your desired dates. Prices include transfer to and from Calgary, all meals, all accommodations (incl. 2 nights in a bedroom at the ranch). 5% federal tax is not included. All Prices quoted in Canadian Dollars. Dates shown include the arrival and departure day. During the “Mountain” part (Day 1-4), you will sleep in the guesthouse at the Ranch. Once we deploy to the Southern Prairies (day 5-9), we will be camping, except for one night in the small town of Manyberries, where we stay in a small, prairie-style hotel with a real saloon. It's not a luxurious place, but a dry one with a warm shower. The last night is spent again in the guest house at the Ranch. Price includes: 8 days of guided riding, with historical and natural interpretation, all meals from dinner 27 May until breakfast 05 June, 5 nights in our guesthouse, 1 night in hotel in Manyberries, 3 nights in camp (tents), Transport from Calgary to Bragg Creek and to trail-head (Milk River) and return (from Elkwater, Alberta and PHENOMENAL MEMORIES! Not included is alcohol with your meals and on the trail, 5% federal tax. Dietary: We cater to all types of dietary restrictions, including vegetarian, lactose free and gluten free. Reflecting the premium prices on gluten free products, we charge $100 ($10 per day) for gluten free dietary requests. Level of Experience: intermediate to advanced, expect to ride up to 25 miles (40km)/day – 7+ Hours. Accommodation: 5 nights at the (surcharge for single room applies) ranch, 3 nights in camp, 1 night in hotel. This Trip will wake the Canadian in you! Using the ultimate transportation modes of the explorers and the Native Indians, you will spend 3 days of canoeing on the beautiful Milk River followed by 4.5 days (140 km) riding across the open plains of Southern Alberta, from the Sweetgrass Hills on the Montana border to the Cypress Hills in Saskatchewan. Explore the magical coulees and badlands of the Milk River, and ride along routes that were once used by Indians, whiskey traders, fugitive outlaws, and the North-West Mounted Police. The Milk River meanders through the Southern Prairies, often carving deep trenches into the sandstone hills. The water runs with a steady current, punctuated by the occasional short rapid. It is relatively warm, narrow and suitable for novice paddlers (with a guide). It is the only river in Canada that flows into the Gulf of Mexico via the Missouri/Mississippi. The camp locations change daily. During the canoeing part, we carry our gear with us in the canoes, stowed away into waterproof containers. We sleep in 2-3 person tents near the river. After we meet up with the horse party, our gear is transported by truck from camp to camp. We will have one or two larger canvas wall tents with cots and also smaller tents to allow for best sleeping separation given the demographics of each group. Price includes: 8 days of guided riding & canoeing, with historical and natural interpretation, all meals from dinner 27 May until breakfast 05 June, 3 nights in our guesthouse, 1 night in hotel in Manyberries, 5 nights camping, Transport from Calgary to Bragg Creek and to trail-head (Milk River) and return (from Elkwater, Alberta) and PHENOMENAL MEMORIES! Level of Experience: experienced, expect to ride up to 25 miles (40km)/day – 7+ Hours. Pace and Terrain: many trots and canters for several miles, river crossings, grassy slopes. This short weekend getaway gets you right into the mountain scenery of Kananaskis Country. This area is famous for it’s beauty and has been featured in movies like “Brokeback Mountain”. Whether this is a short getaway from daily life or to see a snippet of the wilderness while your are exploring Canada’s wild west – this trip will expose you to great views, sounds and scents and the feeling of being “out there”. 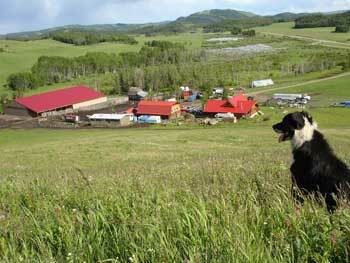 Day 1 (Friday) Arrive at the Ranch near Bragg Creek at 10 am. After meeting the team, you will be issued your kit bag (sleeping bag, sleeping mattress and duffle bag) and given time to pack your personal items into the duffle bag. We will then meet the horses and get to know them while grooming, tacking and getting on them in the arena to adjust stirrups and get a feeling for the horse. After a picnic lunch at the ranch, you will load up and take a short drive to the trail head. Here the pack horses are loaded with the gear and food for the next 2 days. You then set off on the 3 hour ride into Camp. Everyone sets up camp together and then enjoys a good campfire cooked meal. Day 2 (Saturday) After a hearty breakfast, you will set off on a day ride, without the pack horses, over Jumping Pound Ridge. The views from the top are breathtaking. After about 6 hours you return to the camp. Day 3 (Sunday) After breakfast you break camp and load up the pack horses, who will depart with a wrangler. Depending on weather, and the interest of the group, one of 2 different routes will be selected to return to the pick up location at Little Elbow, at around 4 pm. After returning to the ranch, you will turn out the horses and say your farewell’s. Prices include: 3 days of guided riding, all camping gear, wrangler guides and all meals. Level of Experience: enjoyable for all riders that are physically fit and healthy, should have ridden on at least a couple of 1-hour trail rides previously. Accommodation: 2 nights in camp(pup tents & under tarps. 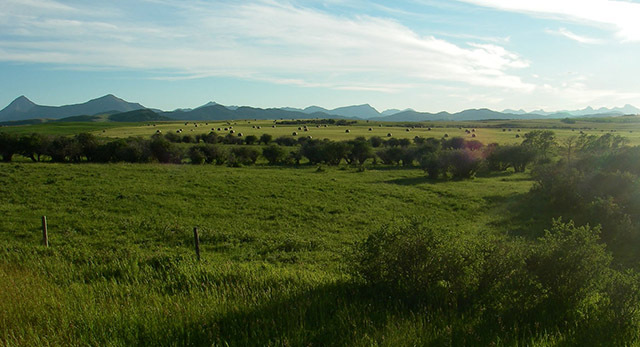 Ride 5 days in Kananaskis Country and finish with a Ride in Writing-On-Stone Provincial Park, Southern Alberta. It is the perfect combination for all those who can't decide whether to enjoy the quiet wilderness of the Canadian Rockies or gallop across the Prairies and through the badlands of Southern Alberta. Price includes: 8 Days of guided riding with historical and natural interpretation, all meals from dinner on arrival day to breakfast on departure day, 3 nights in the guesthouse at the ranch, 6 nights in camps (walled tents), transport to and from Calgary and to and from Writing-On-Stone Provincial Park and PHENOMENAL MEMORIES! Not included is alcohol with your meals or on the trip and 5% federal tax. Accommodation: 3 nights in shared rooms (double or multiple occupancy) in Ranch guesthouse and 6 nights in camp. Most people around here will tell you that their favourite time of year is when the aspen trees turn golden yellow and the mountains get their first dusting of snow. We call it Indian Summer, when warm and clear days with blue skies generate crisp, vibrant colours. The air smells fresh, the play of light and shadow is dramatic and foreshadows the change of season. This is statistically the driest time of the year. Night time temperatures are often below zero, but the day time highs are typically in the high teens and can reach the mid-20s. During this week long vacation we aim to ride trails that let us appreciate the fall colours the most. The foothills are an ideal setting. Each day starts with a freshly prepared breakfast in our guest lodge. With either full breakfast of bacon and eggs, pancakes or waffles and fruit, you will head out on the trail fully charged. Lunch will be taken in a scenic spot along the trail and dinner is served as a family style meal in our guest lodge. We take great pride in using fresh and local ingredients and prepare all meals from scratch using proven recipes. After breakfast, you will meet “your” horse. After grooming and tacking you can get comfortable in our arena first before we head on our first ride to Whiskey Ridge. A four hour ride is planned in the foothills west of Bragg Creek, followed by some time to tour and shop in the hamlet of Bragg Creek before returning home for supper. Departure is normally scheduled for 9:30, which will have you at your Calgary location by 10:30. Price includes: 5 days of guided riding with historical and natural interpretation, 4-6 hours per day, all meals from dinner on arrival day to breakfast on departure day, transport to and from Calgary (to Bragg Creek- remove) and PHENOMENAL MEMORIES!! Accommodation: shared rooms (double or multiple occupancy) in Ranch guesthouse. These five days give you lots of time to develop an affection and appreciation for both your horse and the Canadian wilderness, though almost everyone agrees that the time flies quickly and they are left with the urge to return and explore other untracked valleys and ridgelines. This trip runs Sunday through Saturday. Arrival day is Sunday, departure day is Saturday. You will spend the nights before and after the trip in the Ranch. We pick you up from the Calgary around 4:00 in the afternoon. It is about a 1 hour drive to ranch, welcome and check-in. Meet & greet and dinner at the Ranch. After breakfast, you will meet “your” horse. After grooming and tacking you can get comfortable in our arena first before we head out for the day. We take it easy the first day and ride through the forests and meadows of the Foothills until we reach camp. Typically, we ride between 4 and 5 hours on the first day. After a long day yesterday, we will take a little break and explore the valley where we are camped. A short ride will take us to scenic views, there is a waterfall that can be explored as well. On a hot day, it’s great to spend some time at the river and relax or go for a swim. We expect to ride for about 4 hours. We are not moving camp today. Today we take a longer ride around a mountain range. While the ride may be a little long (7 hour), it is very scenic and will stay in your memories for a long time. After breakfast, we will break camp and depart the valley that we have grown to love. Today's riding may range from 3 hour to 5 hours depending on the specific route. No matter the route, the day will be filled with phenomenal views. In the afternoon, we reach the trailhead, where we will be picked up by the trailer. After a short drive back to the Ranch you will relax, shower and let the memories settle before we all get together for a final dinner in the lodge. Prices include: 5 days of guided riding in Kananaskis Country, pick up from Calgary and return transfer to Calgary, 2 nights at the Ranch, all meals from Sunday night to Saturday morning. Elevations range between 4400' at the Ranch, to over 8400' at Paradise Pass. Routes may vary due to a variety of natural conditions. On some sections of trail the riders are required to dismount and walk their horses for safety. There are other destinations that require the horses be tied and people hike the last mile or so to reach an alpine lake, so a reasonable level of personal fitness is required. Explore beautiful lakes that invite for a refreshing swim, snowcapped mountains passes and lush meadows with clear streams running through. We resist to publish a detailed itinerary for the 10 day trip since weather, experience level of the group, group size and other conditions like water level of rivers and snowpack vary and lead us to make the decision on the spot which trail is the best to take. The trip runs Sunday through Tuesday. Your arrival day is Sunday. We meet at the ranch and have a reception BBQ which gives us the opportunity to answer questions, map out the route for the coming week and match you with a horse according to your abilities. You will spend the first night in a in our guesthouse at the Ranch. Monday morning we groom, tack and pack our horses and deploy. After 8 days of riding in the Mountains you return back to Bragg Creek where our guesthouse awaits you with a hot shower. We meet in the evening for a farewell dinner in one of Bragg Creeks excellent restaurants. Departure day is Tuesday. Prices include: 8 days of guided riding in Kananaskis Country, pick-up in Calgary and return to Calgary, two nights in our Ranch guesthouse, all meals from Sunday night to Tuesday morning. The Elbow Loop Teaser Tour is intended for outdoor and horse loving people that want to start easy or don’t have the time to join our week long trips . The tour is also a great choice for groups and families of mixed experience levels. Plan to arrive at the ranch between 9:30 and 10:00 am to check in. After an introducing the team you will be taught the basics about horse handling and horsemanship. You will then be hands on and get to know your four-legged partner for the next few days as well as learn to groom and tack. After lunch you will go for a relaxing afternoon ride on the ranch. After taking care of the horses, you will be issued your kit bag (duffle bag, sleeping bag and mattress). Dinner is served in the guesthouse, where you will sleep in a comfortable bed for the night. After breakfast, you will ready your horses, load up and drive to the Little Elbow Trailhead. 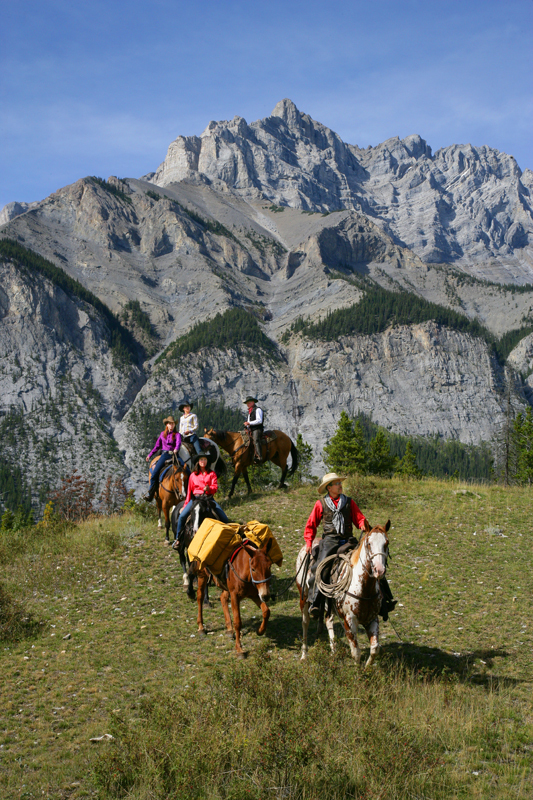 Here the packhorses will be loaded up with the gear and food needed for the next few days, and you then ride about 4 hours up the valley of the Little Elbow River to the campsite, located beneath the towering mountains of the Opal Range. After a hearty breakfast cooked over the campfire you will pack up camp, load up and ride past Tombstone Lake where you will stop for a break (and swim if you are keen), continuing over Tombstone Pass (7,400 ft/2,260m) to Tombstone camp. Depending on the pace, it will take about 4.5 hours to get there. Keen riders can go on an evening ride without packhorses to see the Sheep Lakes (2 hours return), while others can relax in this pretty campsite. Once again, you break camp in the morning and continue the loop down the headwaters of the Big Elbow River into the valley. After Lunch you take a short detour and explore a hidden waterfall thundering down a cliff. You will then reach the final destination (where you started 3 days ago). Back at the ranch you will say your good bye’s – hopefully this teaser has whet your appetite for more adventures in the back-country! Prices include: 1 night at the guest ranch, 2 days of guided riding, and all meals. 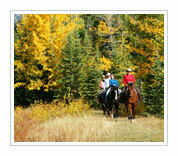 Anchor D has enjoyed offering overnight horseback riding vacations and trail rides to guests for over 28 years. Have a look and choose the horseback adventure that suits you the best. However, if you are a group or family, please contact us for information on making a unique group or family booking. You'll travel by horseback into the High Mountain Wilderness Camp, situated at 6500 feet elevation and completely surrounded by mountains. It is most of a day's horseback ride into this camp, offering canvas outfitter tents with cots and foam mattresses for guests, a bathroom tent and a large kitchen and dining tent. The trips leave the ranch at 10 a.m. Monday mornings. The horses are trucked to the trailhead, where supplies are loaded into the covered wagon and everyone gets on their horse. You then hit the trail for the 12 mile ride through the mountains to the High Mountain Wilderness Camp. You head out in a different direction from the Wilderness Camp each day. There are mountain lakes, stocked with cutthroat trout; a high mountain pass where you ride up to 8500′ to see the Continental Divide open up in front of you; and Burns Canyon where you can climb up beside Burns Falls, which is the highest waterfalls in Kananaskis Country. Price includes: Four days of guided riding, all meals from lunch on the first day to lunch on the final day, 3 nights in a canvas outfitter tent. Not included: Alcohol & pop with your meals, sleeping bag and personal gear. Level of Experience: novice to low intermediate experience and a reasonable fitness level required. Pace and Terrain: Riding through rivers, valleys, canyons and passes, we travel through some incredibly rugged country where you will gain a new respect for your sure-footed mountain horse. Accommodation: Three nights in canvas outfitter tents with cots and foam mattresses for guests, an outhouse, shower tent and a large kitchen and dining tent. Be a cowboy or cowgirl for the weekend. Friday: Meet at Anchor D at 12:30 p.m. The horses are trucked to the trailhead, where supplies are loaded into the covered wagon and everyone gets on their horse. You then hit the trail for the 12 mile ride through the mountains to the High Mountain Wilderness Camp, which will take 3 to 4 hours. Saturday: Breakfast is served at 8:30 a.m. You leave camp at 10 a.m. and head out for one of several destinations that are available. You may ride to a mountain lake full of cut-throat trout (bring your fishing rod and license) or to a high pass that will let you gaze across several mountain ranges to the Continental Divide. No matter the destination, you'll see miles of mountains, valleys, rivers and meadows. Sunday: Breakfast is at 8:30 a.m. 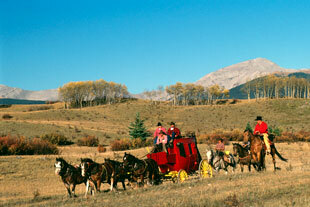 The horses are ready and the wagons are packed ready to hit the trail by 10:30 a.m. The wagons go on ahead, while the riders go on a side trip to have lunch on a high pass or up a scenic canyon, before heading for the trailhead. Arrival time at the trailhead is between 4 and 5 p.m. (that's Cowboy Time!). Price includes: Three days of guided riding, all meals from supper on the first day to lunch on the final day, 2 nights in a canvas outfitter tent. Accommodation: Two nights in canvas outfitter tents with cots and foam mattresses for guests, an outhouse, shower tent and a large kitchen and dining tent. Prepare to be pampered for this six-day horseback riding vacation at the Anchor D Ranch, when the hills are beautiful in their new spring colours. Meanwhile, Back at the Ranch is unique from the other horseback adventures. 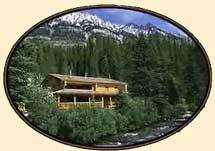 Instead of roughing it in mountain camps, you'll stay in the beautiful log ranch house or cozy log cabins. Enjoy hot showers, comfy beds and delicious meals when you're back from your day rides in the Rockies. Each morning the horses are trucked to the trail head so that you can ride the high ridges to savour the rivers, falls, lakes and canyons of the mountains. You will enjoy your lunch while taking in the breathtaking views from a number of different mountain ranges and high mountain lakes. Take in the ranch lifestyle, without the work! Price includes: Six days of guided riding, all meals from lunch on the first day to lunch on the final day, 5 nights in the log ranch house or cozy log cabins. Not included: Alcohol & pop with your meals and personal gear. Level of Experience: High intermediate to advanced and a reasonable fitness level required. 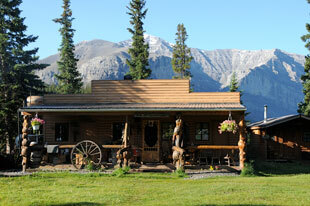 Accommodation: Five nights in the log ranch house or cozy log cabins. This is the most popular trip offered by the Anchor D. It's a 7-day moving trip, using two teams of draft horses and covered wagons to transport the food, camp and duffle to three different camps. 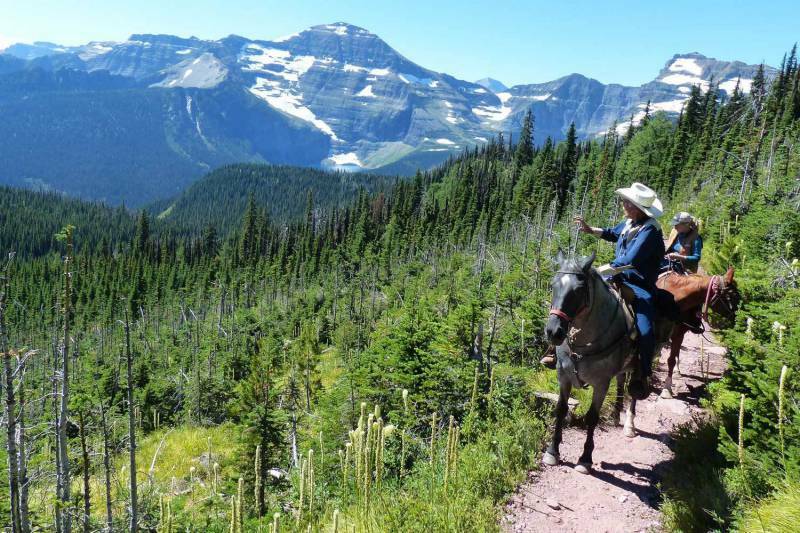 While the wagons roll through the lower elevations, the horseback riders hit the high mountain trails that take you high above timberline, past tumbling mountain streams and through stands of virgin timber. By the time you get to the next camp, the mess tent is set up and a welcome cup of hot coffee is ready for you. Price includes: Seven days of guided riding, all meals from lunch on the first day to lunch on the final day, 6 nights in a canvas outfitter tent. Accommodation: Six nights in canvas outfitter tents with cots and foam mattresses for guests, a bathroom tent and a large kitchen and dining tent. Deep in the heart of the Alberta Rockies, you will explore trails that don't see much more than elk and big horn sheep. This is not a ride for beginners. 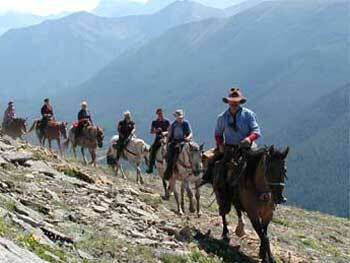 This is a fun-filled seven day horseback vacation, with an explore-as-you-go attitude. A team and wagon haul camp in, and then the horses and riders are trucked to different areas in order to expedite the jump from one mountain area to another. You are going to ride the highest and wildest areas the wranglers can find. The meals are wholesome and there's plenty of it, home-made by the professional back-country cooks. The horses are awesome and surefooted, and the company is fun! Price includes: Seven days of guided riding, all meals from lunch on the first day to lunch on the final day. Level of Experience: Advanced and a reasonable fitness level required. The North Rim to Ranch Ride was developed to offer new country and different riding opportunities to those of you who return year after year. It has also become popular with new guests, and this ride now has rave reviews from all over the world. This 7-day horseback riding vacation starts at the North Rim of the mountain area on the Little Elbow and works its way south through three major river drainages and five different mountain ranges, ambling into the ranch on the last day. You roll into three different camps during the 7 days and your journey incorporates two of the most breathtaking high mountain rides we offer. This ride has run for four seasons now, and it has proven to be a rip snorting success. Guests are absolutely awe-struck with the scenery and it will be in high demand again for this year. Don't miss it! Mantracker star, Terry Grant, is joining Anchor D on a 3-day Weekender. Book your trip early, as there are a limited number of spots available. Terry Grant has been a ranch cowboy for over twenty five years, working for some of the largest ranches in Alberta, Canada. This avid outdoors man has also been a big game guide in northern British Columbia, the Yukon and the Northwest Territories. Terry can engage any size of gathering, and his open, easy-going nature has the ability to connect with many people. Be one of them on this exciting adventure into the backcountry with Anchor D! This Mantracker ride is similar to the Weekenders with three full days of riding. Meet at Anchor D at 9:30 a.m. The horses and gear are trucked to the trail head, where the wagon is loaded, you mount your horse and set off on the trail to Camp. Breakfast is served at 8:30a.m. You leave camp at 10:00 a.m. and head out for one of several destinations that are available. We may ride to a mountain lake full of cut-throat trout (bring your fishing rod and license) or a high pass that will let you gaze across several mountain ranges to the Continental Divide. Either way; you’ll see miles of mountains, valleys, rivers and meadows. Breakfast is at 8:30 a.m. The horses are ready and the wagons are packed by 10:30 a.m. The wagons go on ahead, while the riders go on a side trip, to have lunch on a high pass or up a scenic canyon. Arrival time at the trail head is between 4 and 5 p.m. (that’s Cowboy Time!). Please note: Some riding experience is required. 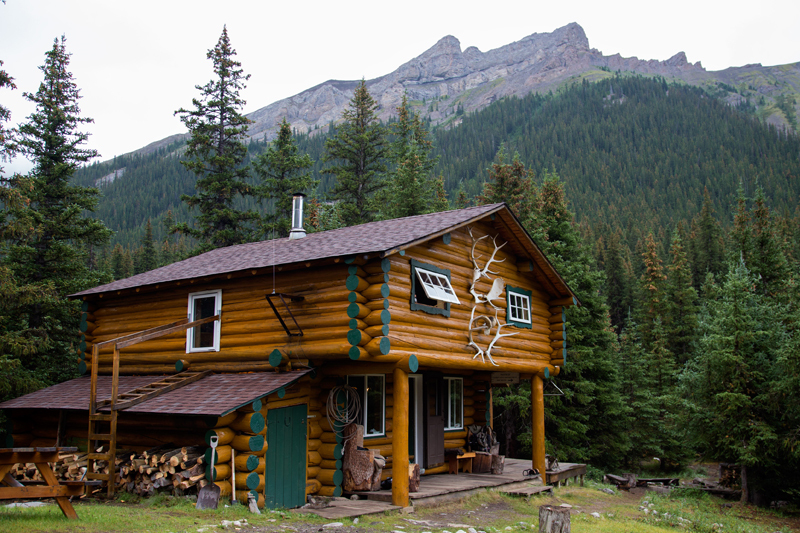 The Outpost is a remote backcountry lodge nestled in the majestic Canadian Rockies, bordering Banff National Park. Fifty miles north of Banff and just over 50 miles west of Sundre, Alberta, The Outpost offers turn of the century charm, with all the comforts of home! With over 30 years of experience in mountain horseback riding, guiding and outfitting, we provide both memorable and safe authentic western horseback vacation packages. 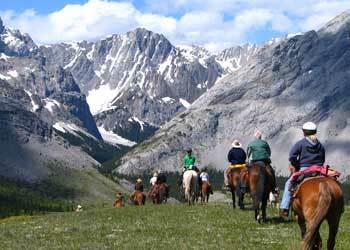 Guided horseback riding in the scenic mountain prairie grasslands of the Ya Ha Tinda Ranch and the Rocky Mountains bordering Banff National Park. Unbelievable, and unparalleled for guided riding! Gourmet, hearty, home-cooked meals beginning with lunch on Day 1 and ending with lunch at The Outpost or on the trail on the last day! Daily activities at The Outpost i.e. explore the trails on foot, relax in the hot tub, fish the Red Deer River, toss some horseshoes, or curl up with a good book and a great cup of coffee! Monday or Friday departures from the staging area at the Bighorn Campground. Days of pick up from our staging site at the Bighorn Campground will vary depending on your length of stay and what is available. Please email info@homeontherange.ca with your preferred dates and we will check availability. Start and close of season may also vary depending on how late spring arrives and how early winter sets in. For the serious, experienced, and balanced rider who is more than just comfortable sitting on a horse! Can you ride and position effectively, move your horse's feet, thereby getting through to its mind? Do you understand what you are asking a horse to do, and know when he gives it to you? Are you comfortable riding energetic and spirited horses out of the arena setting, where there are no rails or walls? How is your timing, awareness and release? Can you get your horse's complete attention at all times, no matter what the distraction may be? Can you anticipate what a horse is going to do before he does? If you answered a resounding yes to all of these questions, than you qualify to ride the gaited horses and join the MILE IN STYLE! The horses travel in their "gaited walks" at twice the speed (and more depending on terrain and distance) of a non-gaited horse at a walk. You will be racking up saddle time, learning a thing or two about maximizing the connection between horse and rider, and safely and effectively communicating with the horse on the ground, in the saddle and on the trail. Learn how to get exactly what you ask of the horse, and what you want! Most gaited horse breeds are not genetically programmed to gait, and poor riding, poor shoeing, and poor handling, can all diminish a horse's ability to get into its particular gait(s), and comfortably stay in gait while travelling at speed. The goal is to have you help not hinder these gaited horses! Previous gaited horse experience is an asset but not mandatory. 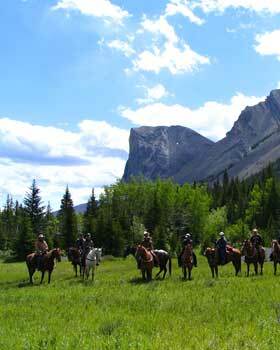 Guided horseback riding on gaited horses (Tennessee Walkers) in the scenic mountain prairie grasslands of the Ya Ha Tinda Ranch and the Rocky Mountains bordering Banff National Park… Unbelievable and unparalled for guided riding! One to one instruction to improve your gaited riding skills. Be prepared to rack up the mileage! Daily activities at The Outpost i.e. explore the trails on foot, relax in the hot tub, fish the Red, toss some horseshoes, or curl up with a good book and a great cup of coffee! 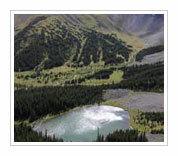 This summer's rides are in the Castle Wildlands area in southwestern Alberta, Canada. Our wilderness base camp, known as “Teepee Town” will be located on Mill Creek, north of the border of Waterton Lakes National Park. Our camp, although “rustic and wilderness,” has private accommodations for individuals, families and friends, in walled tents and native Indian style canvas teepees, complete with raised cots and mattresses. Our hot home cooked meals are served in a large kitchen/dining tent and we have plenty of hot water, washbasins, a hot private outdoor shower, separate men's/lady's washing tents, and dry toilets. The traditional “Doughnut tent” is where we gather in the evenings around the campfire for our traditional “sing-song” with music, entertainment, and educational talks. All this fun while the professional staff look after the food, the horses, and your safety and well being. It is a complete holiday package! NOTE: You will have arrived in Calgary on the day prior, or earlier, to the beginning of your Trail Riders of the Canadian Rockies adventure, so that you are available for the early morning departure on Day 1. NOTE: You will also want to book accommodation for the final night of your adventure, as you are not expected to arrive in Calgary before 8:00 PM. Transportation provided from the Acclaim Hotel, Calgary to the trail head. The bus departs from the Acclaim Hotel Monday morning at 8:00 am to start your adventure, so please arrive at 7:30 am for check-in (be sure to have a hearty breakfast in advance of your arrival). Your host will be on board to register you, brief you on details for the week and answer your questions. As part of introducing you to our western history and culture, our first stop will be, the famous Bar U Ranch National Historic Site, where we will have a 2 hour tour followed by lunch. Next we are off to the corral where you will meet the staff; there will be a safety orientation, and then you will be introduced to your horse. Horses are matched to riders according to the specifications that you will have given in your registration. Saddle bags will be available to you there for your insect repellent, camera, binoculars, energy bars, water bottle, gloves, sunglasses, and an additional sweater, all of which will come in handy for your ride. Bring your rain slicker and keep it separate as it will be tied to your saddle. After arriving in camp, you will settle in to your comfortable accommodations and get ready for “happy hour” and dinner. The chefs will prepare a multi-course dinner that quickly wipes away those hunger pangs. You will be surprised what our chefs can prepare: (alternating) roast chicken, BBQ steaks, baked ham, roast beef…. Sides include: potatoes, vegetable, salad, coleslaw and of course dessert! NOTE: this is a set menu; please let us know of allergies and or dietary concerns. Accommodations may be made where possible. After dinner, as the sun dips below the mountains, a roaring campfire is started in our “Doughnut tent” (weather dependent). As you enjoy your favourite beverages, you may be entertained with music for a campfire sing-a-long, story telling, educational talks, squaring dancing, and/or cowboy poetry. With a full belly of food and drink and some good laughs with new friends, everyone turns in for the evening. The breakfast bell will ring for all to gather in the dining tent for a hot and hearty breakfast (alternating) – eggs, bacon, sausage, hot biscuits, pancakes, bacon, fruit and French toast. Your morning ritual will include hot coffee in the dining tent and perhaps a wash at our rustic wash areas with plenty of hot water. After breakfast, guests will prepare their own picnic lunches choosing from a variety of breads, cold cuts, drinks and snacks. Next, everyone will meet at the corral where the cowboys and the head guide will greet you with a smile and a “how ya’ doin this morning?” The cowboys saddle the horses, check the cinches, and by 9:30 am you are off on the trail. Each day will find you exploring lakes, valleys, glaciers or mountain pass. This area actually gives us more options than we have days to ride! The high, uninhabited valleys of the Rockies offer peace and contentment combined with the thrill of majestic vistas. There is a sweep of majesty to this land, a towering grandeur and nobility of face, so powerful in its vast silence. This alpine land abounds in larch, spruce and fir trees, mountain animals and birds, incredible alpine flowers, meadows and park lands leading to the nearby snow capped peaks and ridges. By noon, we have reached our destination and after lunch, riders can fish, stroll, visit or stretch out for a nap in the hot mountain sun. A camera for these trips is a must! By late afternoon, it’s back to camp for “happy hour” before enjoying a four-course dinner. 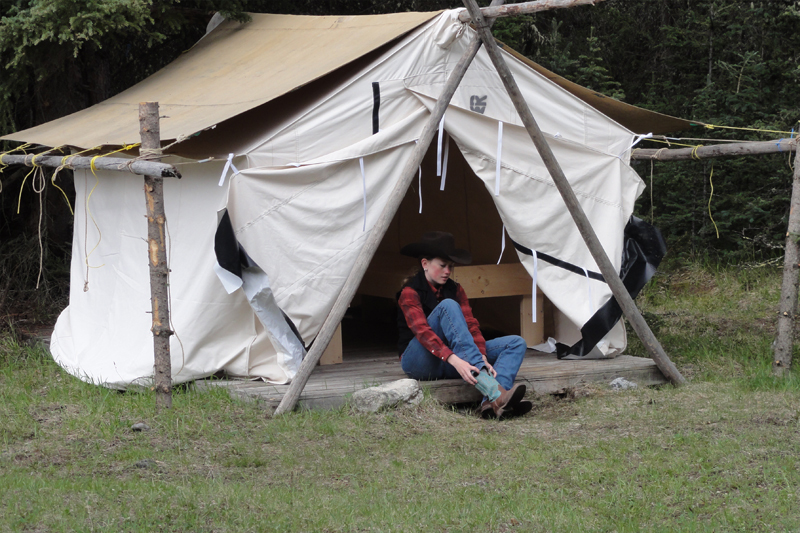 The great thing about traveling with Trail Riders of the Canadian Rockies is that you don’t need to worry about moving camp on a daily basis. However, all good things must come to an end, and today you pack your duffel, and after another spectacular days ride, you return via bus to Calgary. By then it is tears, hugs with newly made friends and sad farewells as we leave each other with promises of, “See ya next year!” There is no official “after the ride dinner,” but riders staying the night in Calgary, often gather for dinner or drinks and one last get together before they go their separate ways. Accommodations in camp with tents/teepees and raised cots with mattresses; wash, shower facilities and dry toilets. Membership in the Trail Riders of the Canadian Rockies (TRCR). The TRCR is a non-profit society and as such are required by the Government of Alberta to charge a membership fee. Transportation costs to the City of Calgary. Accommodation and meal costs before and after your ride. Saddle bags, cots and mattresses are supplied, however, duffel bags, rain gear, or sleeping bags are not supplied. If you are traveling from outside Alberta and do not wish to pack a sleeping/duffel bag, we may be able to help you; Please ask. Alcohol; We DO NOT sell alcohol; so please feel free to bring your own.